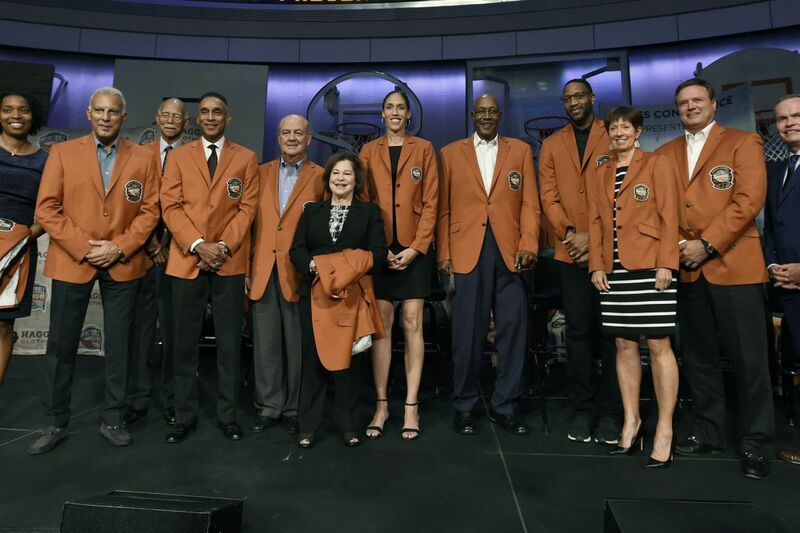 The 2017 class of inductees into the Basketball Hall of Fame, from the left, Lauren Meyers, accepting on behalf of her late great uncle Zack Clayton, Nick Galis, Robert Hughes, Mannie Jackson, Tom Jernstedt, Thelma Krause, accepting on behalf her late husband Jerry Krause, Rebecca Lobo, George McGinnis, Tracy McGrady, Muffet McGraw, Bill Self, and Naismith Hall of Fame President and CEO John Doleva.pose for a group photo at the end of a news conference at the Naismith Memorial Basketball Hall of Fame, Thursday, Sept. 7, 2017, in Springfield, Mass. SPRINGFIELD, Mass. – Former St. Joseph's star Muffet McGraw has accomplished much in her storied career since taking the helm of the Notre Dame women's basketball program in 1987. An NCAA title came in 2001, and these days McGraw's squad is an annual favorite to make the national finals. But Friday night, as many of her players-turned WNBA All-Stars, along with family and friends and her Hawks teammates looked on, the 61-year-old McGraw, who grew up in West Chester, reached the pinnacle as one of 11 inductees into the Naismith Basketball Hall of Fame at Symphony Hall. "I never dreamed that playing a game could lead to a 40-year career," she said in an acceptance speech that lasted under seven minutes. "I never dreamed my future could lead me here." Former 76ers star George McGinnis and the late Zack Clayton, a Gratz High grad who played during the Black Fives era in the late 1930s and early 1940s for such teams as the Philadelphia Panthers and the Harlem Globetrotters, are the other two inducteed with local ties. Said McGinnis, "My 1975 journey took me to the City of Brotherly Love. Me and my wife grew up there, and I really fell in love with the city. I played three years there, and we made the playoffs all three seasons I was there. I was an all-star two of the seasons." McGraw took quick deep breaths several times during her video tribute and speech to avoid being overcome by her emotions. She spoke to her local roots at the outset. "The first good decision I made was going to St. Joe's," she said. "I made some lifelong friends, and I'm so happy that my former teammates and friends and Don DiJulia, our athletic director, are here to share this moment with me. "We've come a long way since our playing days, and so has women's basketball. I love this game," she said. "And I never could have imagined when I started coaching Archbishop Carroll in 1977 that it would take me to so many places I would have never seen and given me so many experiences that have changed my life." McGraw, who spoke third, was escorted to the podium by Hall of Famer Ann Meyers-Drysdale. The local crowd then had to wait until next to last to hear from another women's basketball notable, former University of Connecticut great Rebecca Lobo, who grew up near here in Southwick, Mass. Lobo has become an accomplished analyst as part of ESPN's women's basketball coverage of NCAA and WNBA competition. She was escorted by her coach, Hall of Famer Geno Auriemma, whose powerhouse program. Auriemma, who grew up in Norristown, noted in McGraw's introductory video: "We're from Philadelphia. We don't know everything, but we act like we do. And Muffet's the same way. I love her. There are times you have to back it up. "The freedom that they play with. The confidence that Muffet instills in her players. Her style is the toughest match-up for us year in and year out." McGraw paid tribute to her husband, Matt, whom she met her senior year on Hawk Hill, calling Notre Dame "the second-best decision I ever made."